It's Apple vs. Amazon Over "Appstore"
It's King Kong Bundy versus Andre the Giant all over again, as Apple sues Amazon for using the name "Appstore" for its mobile application portal. The App Store is like the Kleenex of the mobile market. Not just because most of what comes out of it gets used once and thrown away, but because for the general public it's evolved from a brand to a generic name for something used to wipe the gunk out of your schnoz or, in this case, a place to buy mobile applications. But App Store, like Kleenex, remains a trademark nonetheless, and Apple isn't too happy about Amazon's use of the slightly-modified term "Appstore" as the name for its own app store for Android. See? I can't even describe it without calling it an "app store." But making it official goes a little too far for Apple's liking, so it filed a lawsuit against Amazon seeking an injunction against its use of the Appstore name as well as unspecified damages. The company says Amazon is infringing upon its App Store trademark in a way that will "confuse and mislead customers," and claims that Amazon also intends to use the name for a planned mobile application download service. 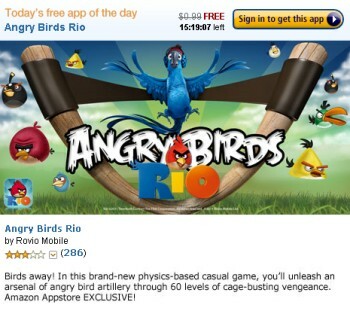 Apple also claimed that Amazon has "unlawfully used the App Store mark to solicit software developers throughout the United States," a statement perhaps fueled by the front-and-center presence of Angry Birds Rio, an Amazon-exclusive version of the massively popular iPhone game. Apple's application to the U.S. Patent and Trademark Office to register App Store was approved last year but Microsoft filed an appeal of that decision, saying the term is "too generic" to be trademarked. That matter is still working its way through the USPTO appeals process.